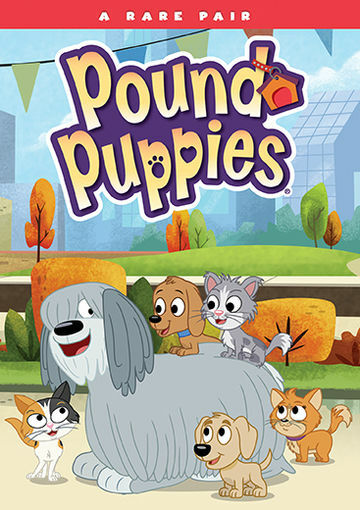 One Momma Saving Money: Pound Puppies - A Rare Pair out now on DVD! Pound Puppies - A Rare Pair out now on DVD! It's Raining Cats And Dogs - And An Alligator - At Shelter 17! Lucky, Niblet, Cookie, Squirt and Strudel are back for five more exciting adventures of the Pound Puppies! From trying to get a kitten and a puppy adopted into the same home, to trying to place an alligator named Rover(! ), to sneaking into the Kennel Kittens' compound to retrieve a stolen gadget, this team of determined canines will do whatever it takes to find the perfect loved ones for each and every pet at Shelter 17! Winner of the 2012 Humanitas Prize in Children's Animation, the Pound Puppies series star the voices of Eric McCormack, Yvette Nicole Brown, Michael Rapaport, John DiMaggio, Alanna Ubach, Rene Auberjonois, and M. Emmet Walsh. I grew up playing with the classic Pound Puppies , so this series is a favorite here. It brings me back to my childhood and helps to share the love of shelter pets, which is near and dear to me! The "leaders" of the Pound Puppies make it their mission to make sure animals find a good home with loving people. Each episode is fun to watch and teaches children valuable lessons! Purchase Pound Puppies: A Rare Pair on Amazon for $12.99 & FREE Shipping on orders over $35.